Find out more about why we do not offer refunds. Exceptions may apply. Flipsnack subscriptions are set to renew automatically at the end of the billing cycle (yearly or monthly) which means you will be charged the day the subscription expires unless you choose to cancel the renewal. 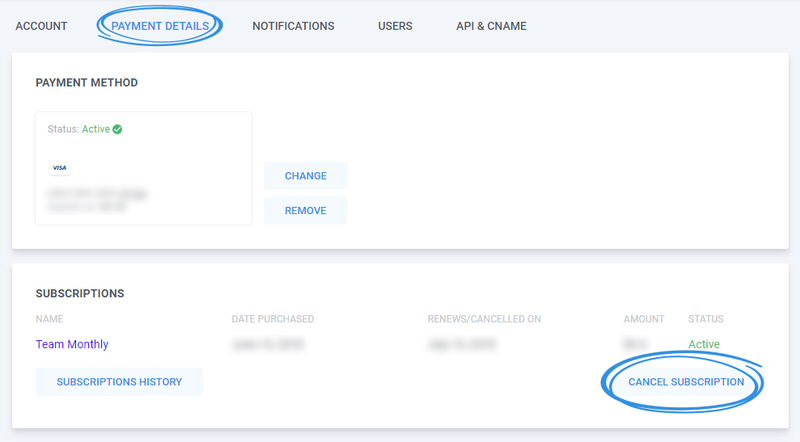 You can cancel your subscription at any time by accessing Account Options -> Payment Details -> Cancel Subscription. Whether you make a purchase with Paypal or Credit/Debit card, we will notify you of the recurrent payment process and the length of the billing cycle. Because of the nature of our product we have a no refund policy. Unlike physical goods, electronically distributed software can be duplicated and once a purchase has been made, it is impossible for us to recall all copies/downloaded files. This is why we don’t offer refunds. No refunds will be given except in the company's sole and absolute discretion. We may consider making an exception to the no refunds rule if your subscription just renewed and you are no longer using Flipsnack. This means that the charge must be recent and you have not used our services since the transaction. If that is the case, you can get in touch with our support team on the live chat or submit a ticket and request a refund. Your request will be processed in maximum 24 business hours.